This article is part three of our “The Contender” series. The NHL season may have just started, but some real favorites have emerged as true contenders. For those that haven’t read the other “The Contender” posts, this article will summarize my picks for this year’s Stanley Cup winner, including one chalk pick and one dark horse. Chalk Pick: Montreal Canadiens (19-6-3)-Montreal has everything you would want in a Stanley Cup winning team. Starting in net, Carey Price has carried the Habs for many seasons and has really stepped up his play as he enters his prime. 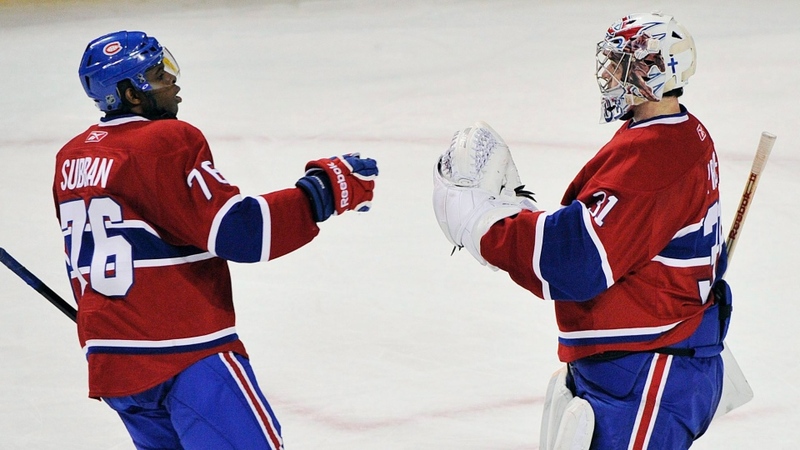 Along with Price, the Habs defense has improved as well due to the emergence of P.K. Subban. Subban has taken a leadership role alongside fellow defenseman Andrei Markov. The top D pair for Montreal has 39 points in 56 games. Over the past few seasons, the Habs weren’t able to get over the hump as they relied too much on Carey Price. However, their offense has emerged as a real scoring threat, ranking second in goals per game with a whopping 3.32. Max Pacioretty and Brendan Gallagher have been huge on the top line, scoring 24 combined goals. It’s rare that you see a team with such a strong balance of offense, defense and goaltending. The Habs have a legitimate shot of winning the cup this year. New York Rangers (18-7-3)-The Rangers have been there before and it is likely that they compete to be there again this year. Lundqvist is healthy and leading the league in save percentage again this season. A good team starts with a good goalie. And Lundqvist isn’t just good, he’s a top tier goalie. The Rangers acquisition of Keith Yandle has helped bolster an already strong defensive unit. The pair of McDonagh and Girardi has been especially strong with a +23 rating through 28 games. The Rangers top offensive line (Zuccarello-Brassard-Hayes) has combined for 57 points. The second line (Nash-Lindberg-Kreider), however, is not far behind with 47 points. The Rangers success has lied in special teams this season, ranking fourth in Power Play % and sixth in Penalty Kill %. Lundqvist has carried this team in previous seasons, but the team’s offensive defensemen should help contribute as the Rangers look to make a fifth cup run. Dallas Stars (21-5-2)-This is the only team that doesn’t rely on their goalie to produce wins. Dallas has the most potent offense in the league and has really put it together this year. They acquired Patrick Sharp via trade this offseason. He has joined the top line with point machines Jamie Benn and Tyler Seguin and as a trio, they have lit the league on fire. They are probably the best trio in the league, combining for 91 points thus far. The Stars also excel on the power play, ranking third in the league in percentage. The Stars are one of the most explosive teams in the National Hockey League. However, they have some major problems on defense. Despite having offensive defenseman like John Klingberg and Alex Goligoski can help, they have had difficulties stopping teams. In their 5 regulation losses, they have given up an average of five goals per game. They have no real permanent solution in net, either with Antti Niemi and Kari Lehtonen leading a Goalie by committee platoon. If the Stars can acquire a good quality starting goalie or have one of their incumbents step up, they are really dangerous this year out west. Washington Capitals (19-5-2)-Anytime you have Alexander Ovechkin on your team, you have a chance to win games. Ovechkin is one of the greatest goal scorers the league has ever seen and has continued his ways this season by scoring 13 goals in 25 games. Normally, that total is much higher, but he has gotten an increased contribution from his teammates. In last year’s postseason, we saw just how good young stars Evgeny Kuznetsov, Marcus Johansson and Andre Burakovsky could be. This year, they have continued their momentum and have helped play a big role for Washington. The addition of American hero T.J. Oshie also helped Washington as it gave Ovechkin another reliable scoring option on the top line. With Mike Green gone, John Carlson has taken on a larger role as the power play quarterback and has picked up 19 points along the way. The Caps have also seen an improvement in the crease this season, ranking third in goals allowed per game. Holtby is a rising star and should be honored as one of the top goalies in the league. As I said, having Ovechkin always helps, but the Caps surrounding cast of talent should have what it takes to make a deep playoff run. Dark Horse: Los Angeles Kings (18-8-1)-Like Dallas in 2013, it takes time to adjust after bringing in a top notch talent. The Kings struggled at the beginning of the season, but has since adjusted with six wins in seven games. Milan Lucic was brought in to help bring some offensive firepower to an already potent offense. Added to a line with Anze Kopitar and Marion Gaborik, the Kings expected a ton of production. However, Lucic and the Kings struggled and led to a line shuffle. Since, Lucic has found great chemistry on the second line with Jeff Carter and Tyler Toffoli. Jon Quick was a big contributor in the 2012 and 2014 championship runs and has been excellent so far this season. Overall, the Kings goaltending has played a large role in their comeback, allowing a mere 2.07 goals per game. As the Kings get healthier, they should have all the pieces in place to rise up the standings and make their mark in the 2015 Stanley Cup Playoffs. This entry was posted on December 9, 2015 by Dylan Bernstein in NHL and tagged Dallas Stars, Hockey, Los Angeles Kings, Montreal Canadiens, New York Rangers, nhl, Stanley Cup Finals, Washington Capitals.